$400,000 FTF March 2-year-old in training, Eclipse Award winning champion 2-year-old, athletic, medium-sized colt with fluid action, extremely tactical and versatile, 1st foal, dam modest maiden-claiming winner but a half-sister to the graded stakes-winning dam of Metropolitan Mile-G1 winner Sahara Sky; tasted defeat for the first time when third at odds-on in 9.5F Preakness S.-G1 over sloppy track at Pimlico in mid-May, pressing an extremely hot pace (opening quarter fastest in race history), hitting the front entering the lane but then weakening in final furlong to finish 3 ½ lengths behind Exaggerator; had won the first eight races of his career including the Triple Crown’s first jewel with a 1 ¼ length victory in 10F Kentucky Derby-G1 while earning a career top speed figure (always within range, quickening to lead comfortably mid-stretch and then holding off Exaggerator while having something left); had entered the Derby fresh from a resounding 3 ¼ length victory in 9F Florida Derby-G1 and before that had made a very favorable impression in 2016 debut in 7F San Vicente S.-G2 at Santa Anita in mid-February (by 1 ½ lengths from Exaggerator); had won all five starts as a 2yo including 8.5F Breeders’ Cup Juvenile-G1 (by ½ length in much-troubled trip); the 8.5F FrontRunner S.-G1 (by ¾ length) at Santa Anita in October, 7F Del Mar Futurity-G1 (by 3 ¾ lengths) in September and 6.5F Best Pal S.-G2 (by 5 ¼ lengths) in August; pedigree leans much more to speed than stamina though he easily stayed 10 furlongs in winning the Derby; was found to have an elevated white blood cell count and temperature two days after the Preakness and therefore will not start in the Triple Crown’s final jewel, the Belmont Stakes-G1; remains top-rated 3-year-old in the U.S. despite his Preakness defeat and likely now will be pointed for major late summer 3-year-old engagements such as Jim Dandy S.-G2 and Travers S.-G1 at Saratoga. 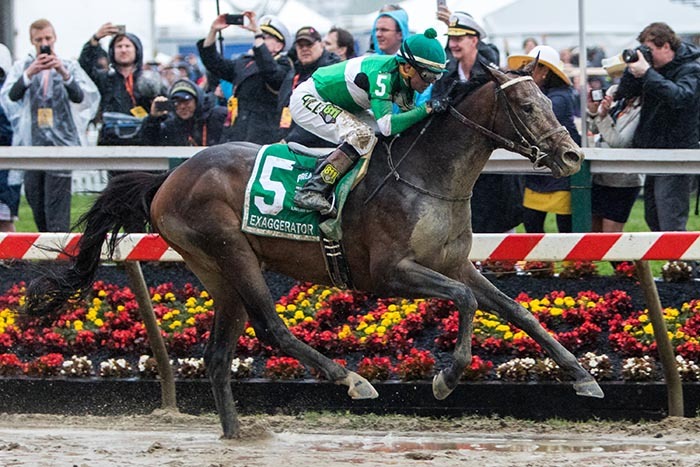 $110,000 yearling, 3rd foal, good-sized, strong, impressive colt, dam stakes-placed half-sister to Canadian champion mare Ember’s Song; has developed an extremely effective deep-closing style, handles any surface but is especially effective over sloppy/muddy; scored his most impressive victory to date in 9.5F Preakness S.-G1 over extremely wet surface in mid-May, making a strong mid-race move inside to move within striking range, awaiting room on the turn, then angling out to rush past previously unbeaten Nyquist in upper stretch to record 3 ½ length victory; two weeks earlier had turned in outstanding runner-up performance in 10F Kentucky Derby-G1, rallying from nearly 18 lengths back and overcoming some traffic trouble on far turn to be beaten 1 1/4 lengths by Nyquist; previously had been highly impressive winning the Santa Anita Derby-G1 victory over a sloppy track in April (rallied from nearly 17 lengths back to win by 6 ¼ lengths from Mor Spirit after producing an exceptional turn of foot into an extremely fast pace); earlier in the year had been considered by trainer to possibly have distance limitations when finishing third, beaten 2 ¾ lengths, to Danzing Candy in 8.5F San Felipe S.-G2 at Santa Anita in mid-March (flattened out final furlong) and in 7F San Vicente S.-G2 in mid-February (loomed threat but made no headway late when second by 1 ½ lengths to Nyquist); culminated busy juvenile campaign with game victory in muddy 8.5F Delta Jackpot S.-G2 at Delta Downs in November after finishing fourth without mishap (beaten 3 lengths) in Breeders’ Cup Juvenile S.-G1 the previous month; bred for classic distance and clearly has proven that longer trips are within his range; scheduled to make next start in Belmont S.-G1 in mid-June; further improvement likely with year-end championship honors now a possibility. 1st foal, dam 9F Gr. 2 winning half-sister to Horse of the Year Saint Liam and to 2 other listed SW’s; possesses tactical speed and employs a stalk/pounce style; turned in career top performance when an admirable third in the Kentucky Derby-G1 (by 4 ½ lengths to Nyquist), always within striking range of hot pace-setter, gaining brief lead at top of stretch but then weakening in final sixteenth; previously had dominated Louisiana-based 3-year-olds with two visually pleasing victories, the 9F Louisiana Derby-G2 (by 4 ½ lengths from Tom’s Ready) in late March and the 8.5F Risen Star S.-G2 at FG (by ½ length from Forevamo) the previous month; had won first two career starts in promising style, an 8F maiden at Churchill Downs in September and an 8.5F allowance race at Keeneland the following month (rallying from mid-pack in both); continues to progress and must be ranked among the very best in his crop though clearly a cut below champion Nyquist; pedigree suggests continued development is likely; will have several excellent opportunities to win major race for 3-year-olds during the summer and into the fall. Strong, powerful, athletic colt with excellent tactical speed; fifth foal; first winner from multi-graded stakes winning sprinter; second dam (by Hail the Pirates) minor listed stakes winner; performed admirably in first stakes appearance when fourth (beaten four lengths) to Exaggerator, always within striking range, losing considerable ground when angling wide into stretch and staying on well final furlong; previously had defeated maidens by 11 lengths in December at Gulfstream Park in 8.5F off-the-turf race and then returning in mid-April to capture first-level allowance at Keeneland by 14 ½ lengths (never asked) after stalking early pace in hand and then taking over at will; earned graded stakes-quality speed figure in latter while giving impression of being capable of much more if needed; will stay classic distance and beyond; still has plenty of room for further development and is scheduled to reappear in Belmont S.-G1 in mid-June; remains an exciting prospect with the potential to be among the best of his crop. $2.2 million yearling, half-brother to Breeders’ Cup Juvenile winner New Year’s Day (by Street Cry); dam multiple Grade-2 winner; flawless, athletic action with tactical speed and the versatility to produce a quick burst; performed reasonably well when rallying from 13 lengths back to finish fourth (though never a serious threat) to be beaten 4 ½ lengths in 10F Kentucky Derby-G1 behind Nyquist; appeared to lose some of his punch in the final stages and may not have stayed the trip; had suffered first career defeat (fourth, beaten 8 lengths) to Nyquist when heavily favored in Florida- Derby-G1 (wide throughout but faded readily after looming threat entering stretch); previously had been highly impressive in five victories, including 8.5F Fountain of Youth S.-G2 at GP Feb. 27 (by 2 ¼ lengths from Zulu), and in Holy Bull S.G-2 (by 3 ½ lengths from Greenpointcrusader) the previous month; began career winning 6F maiden race by half-length at Belmont Park in September, the Nashua S.-G2 at 8F in November (by 1 ¾ lengths) and then the 9F Remsen S.-G2 (by 1 ½ lengths), the latter two races at Aqueduct in November and in both starts beating subsequent Jerome S.-G3 winner Flexibility; likely will have 10F Travers S.-G1 at Saratoga as an ultimate late-summer goal; still has room for further development but may be questionable in races that exceed a middle distance; has the pedigree, style, and acceleration to become an exceptional turf performer if given the chance though that may not come until after major main track events for 3-year-olds are completed by the end of the summer. $400,000Y, full-brother to Creative Cause (Norfolk S.-G1, etc. ); dam won Apple Blossom S.-G1 and 3 other graded stakes; likely was short on conditioning when given the extremely difficult task of competing in 10F Kentucky Derby-G1 following a two month layoff and under the circumstances ran as well as could be expected to be sixth of 20, beaten 7 lengths, after moving with striking range entering the stretch before feeling the effects of the layoff; had previously produced best performance when winning 8.5F Tampa Bay Derby-G2 in mid-March by 1 length from stablemate Outwork with career-top speed figure (good tactical speed to press pace, prevailed final furlong); was nearly as impressive when capturing Sam F. Davis S.-G3 over same course in February (always within range, strong late kick by 2 ¼ lengths from Rafting); pedigree suggests no distant limitations, seems likely to continue to improve with maturity; chance to regain ranking among very best 3-year-olds in his crop in major races during the summer and early fall when having the benefit of a much more consistent, logical, race pattern; reportedly targeting Belmont S.-G1 in mid-June for next outing. $325,000Y, half-brother to listed stakes-placed Honkeytonk Man (by Bluegrass Cat); dam stakes-placed full-sister to Dixie City (Demoiselle S.-G2); family of champion 2yo Dehere; remained unbeaten (in three starts) when enjoying a perfect pace-pressing trip in 9F Peter Pan S.-G2 at Belmont Park in mid-May (by ¾ length from Governor Malibu), finding more under pressure in final furlong to withstand strong late bid of runner-up; began career winning highly-rated 6F maiden at Gulfstream Park by 3 lengths in February and then 7F Bay Shore S.-G3 over muddy (sealed) surface at Aqueduct in April by 3 lengths from next-out SW King Kranz, setting pace inside under pressure and then drawing clear with authority while earning clocking .29 seconds faster than Carter S.-G1 for older sprinters an hour later; stays up to nine furlongs under pristine conditions around one turn but at this early stage of his career might be most effective at distances up to a mile; should continue to develop with maturity and must be considered one of top members of the 2016 sophomore class. $900,000Y, half-brother to 8 winners, including graded stakes winners Heart Ashley and Ashley’s Kitty and to listed stakes winner Indianapolis, dam stakes-placed sprinter; strong favorite (4/5) in 9F Arkansas Derby-G1 but disappointed badly after being sent hard from gate to stalk pace to top of stretch but then fading readily to wind up 10th of 12, beaten 11 lengths; was found to have suffered from entrapped epiglottis necessitating throat surgery; had been highly impressive winning 8.5F Rebel S.-G2 in prior start, overcoming awkward break to quickly establish solid pace inside, lugging in sharply after straightening for home but then fighting off a strong challenge from Whitmore in deep stretch to record 1 ¼ length victory (galloped out full of run) with legitimate speed figure; previously had won eye-catching 8.5F SA maiden by 5 ¼ lengths despite poor trip (stumbled start, wide throughout); pedigree leans slightly more to speed than stamina but classic distances should be within his range; has proven capable of winning on the lead or from off the pace but may be most comfortable if held up early and allowed to produce a late run; has the potential to be a major player in valuable summer events for 3-year-olds if breathing issues are corrected; scheduled to reappear in listed Easy Goer S. June 11 at Belmont Park. $72,000Y, 2nd foal of unplaced half-sister to Composure (Santa Anita Oaks-G1, etc.) and Ready Set (West Virginia Derby-G3); delivered a commendable performance when rallying from 19th of 20 and more than 28 lengths behind (according to official chart) to wind up a fast-finishing fifth, beaten less than 5 lengths, behind unbeaten Nyquist in 10F Kentucky Derby-G1 (torrid early pace certainly promoted his chances); was also race-shape aided when second (beaten 1 ¼ lengths) to fellow deep-closer Creator in 9F Arkansas Derby-G1 at Oaklawn Park in mid-April, having every chance and staying on well to the wire; previously had been victimized by a poor draw, traffic trouble and a wide trip when a non-threatening fifth (willing finish, beaten 5 lengths) to Cupid in 8.5F Rebel S.-G2 in mid-March; had made very favorable impression in 8.5F Southwest S.-G3 in 3yo debut when rallying from last of 14 to win going away (by 2 3/4 lengths from Whitmore); had raced exclusively at Remington Park as a 2yo; deep closing style always makes him pace/traffic dependent; possesses an extended run rather than a sharp turn of foot and doesn’t appear to corner well on sharper turns; might have to settle for secondary awards in top races for 3-year-olds due to his lack of tactical speed but appears the type that always gives his best; has been entered in Belmont Stakes-G1 June 11. $350,000 yearling, 2nd foal, half-brother to 8.5F stakes-placed Midnight Sweetie (by Midnight Lute); dam placed in Woodbine Oaks; was never a factor when staying on with some interest to be seventh of 20 in 10F Kentucky Derby-G1, beaten 9 ½ lengths by Nyquist while racing wide much of the way but having no real mishap; previously had regained his best form and earned a career-top (though moderate) speed figure when capturing 14-runner 9F Blue Grass S.-G1 (by 1 ¾ lengths from My Man Sam), producing strong, steady run from 11th midway to be along in time; had been highly disappointing in 3yo debut the previous month when producing no rally and winding up seventh (beaten 12 lengths) in 8.5F Tampa Bay Derby-G2; enjoyed productive juvenile campaign, winning Breeders’ Futurity-G1 over muddy surface at Keeneland before turning in a good performance when third despite a wide trip in Breeders’ Cup Juvenile-G1 to Nyquist; lacks an exceptional turn of foot but can produce an effective, extended rally; clearly a significant cut below the best in his division but can win a valuable race or two if given a less ambitious campaign; has been entered in Belmont Stakes-G1 June 7. KNOCKING ON DOOR: CHERRY WINE (D. Romans); LANI (M. Matsunaga); CONQUEST ENFORCER (M. Casse); CREATOR (S. Asmussen); AMERICAN FREEDOM (B. Baffert); MO TOM (T. Amoss); GOVERNOR MALIBU (C. Clement); WILD ABOUT DEB (P. D’Amato).